For the past several years, researchers at the University of Illinois at Urbana-Champaign have reverse-engineered native biological tissues and organs — creating tiny walking “bio-bots” powered by muscle cells and controlled with electrical and optical pulses. Now, in an open-access cover paper in Nature Protocols, the researchers are sharing a protocol with engineering details for their current generation of millimeter-scale soft robotic bio-bots*. Using 3D-printed skeletons, these devices would be coupled to tissue-engineered skeletal muscle actuators to drive locomotion across 2D surfaces, and could one day be used for studies of muscle development and disease, high-throughput drug testing, and dynamic implants, among other applications. The researchers envision future generations of bio-bots as biological building blocks that lead to the machines of the future. The bio-bots would integrate multiple cell and tissue types, including neuronal networks for sensing and processing, and vascular networks for delivery of nutrients and other biochemical factors. They might also have some of the higher-order properties of biological materials, such as self-organization and self-healing. “These next iterations of biohybrid machines could, for example, be designed to sense chemical toxins, locomote toward them, and neutralize them through cell-secreted factors. Such a functionality could have broad relevance in medical diagnostics and targeted therapeutics in vivo, or even be extended to environmental use as a method of cleaning pathogens from public water supplies,” the research note in the paper. “This protocol is essentially intended to be a one-stop reference for any scientist around the world who wants to replicate the results we showed in our PNAS 2016 and PNAS 2014 papers, and give them a framework for building their own bio-bots for a variety of applications,” said Bioengineering Professor Rashid Bashir**, who heads the bio-bots research group. Bashir’s group has been a pioneer in designing and building bio-bots, less than a centimeter in size, made of flexible 3D printed hydrogels and living cells. In 2012, the group demonstrated bio-bots that could “walk” on their own, powered by beating heart cells from rats. In 2014, they switched to muscle cells controlled with electrical pulses, giving researchers unprecedented command over their function. * Not to be confused with swimming biobots and rescue biobots using remotely controlled cockroaches. ** Bashir is also Grainger Distinguished Chair in Engineering and head of the Department of Bioengineering. Work on the bio-bots was conducted at the Micro + Nanotechnology Lab at Illinois. Biological machines consisting of cells and biomaterials have the potential to dynamically sense, process, respond, and adapt to environmental signals in real time. 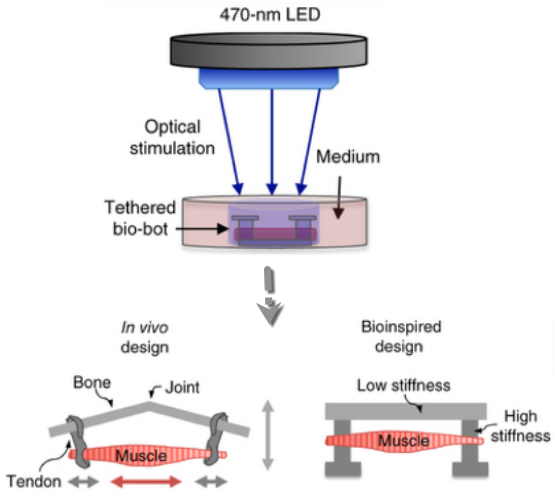 As a first step toward the realization of such machines, which will require biological actuators that can generate force and perform mechanical work, we have developed a method of manufacturing modular skeletal muscle actuators that can generate up to 1.7 mN (3.2 kPa) of passive tension force and 300 μN (0.56 kPa) of active tension force in response to external stimulation. Such millimeter-scale biological actuators can be coupled to a wide variety of 3D-printed skeletons to power complex output behaviors such as controllable locomotion. This article provides a comprehensive protocol for forward engineering of biological actuators and 3D-printed skeletons for any design application. 3D printing of the injection molds and skeletons requires 3 h, seeding the muscle actuators takes 2 h, and differentiating the muscle takes 7 d.